Recently we have published a few articles covering different aspects of Excel conditional formatting. Unexpectedly, it's turned out that it's not creating a rule and even not making a proper formula that represents the greatest challenge. Using proper cell references in Excel formulas appear to be the most complex part and a common source of problems. "I had my conditional rule correct, except for the mixed references." This is what our blog readers have often reported in comments. So, why don't we invest a few minutes to figure this thing out? This will certainly save you far more time in the long run! Absolute cell references (with the $ sign, e.g. $A$1) always remain constant, no matter where they are copied. Relative cells references (without the $ sign, e.g. A1) change based on the relative position of rows and columns, when copied across multiple cells. Mixed cells references (absolute column and relative row (e.g. $A1), or relative column and absolute row (e.g. A$1). 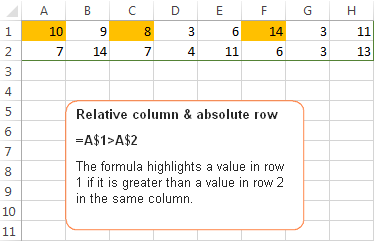 In Excel conditional formatting rules, mixed cell references are used most often, indicating that a column letter or row number is to remain fixed when the rule is applied to all other cells in the selected range. In conditional formatting rules, cell references are relative to the top-left most cell in the applied range. So, when making a new rule, you can simply pretend as if you are writing a formula for the top-left cell only, and Excel will "copy" your formula to all other cells in the selected range. Now, let me show you a few examples that demonstrate how seemingly identical formulas produce different results depending on what cell references types are used. This pattern is most typical for conditional formatting rules and in 90% of cases cell references in your Excel conditional formatting rules will be of this type. Let's make a very simple rule that compares values in columns A and B and highlights a value in column A if it is greater than a value in column B in the same row. Because you always compare values in columns A and B, you "fix" these column by using absolute column references, notice the $ sign before the column letters in the above formula. And, since you are comparing the values in each row individually, you use relative row references, without $. This cell reference type is the opposite of the previous one. In this case, the row number is always constant while the column changes. You use such references when you want to check values in a given row against a certain value or against values in another row. Because you want the row numbers to be fixed, you use the absolute row references, with the $ sign. And, because you want to compare values in each column individually, you create the rule for the left-most column (A) and use relative column references, without the $ sign. You use absolute row and absolute column references if you want to compare all values in the selected range with some other value. 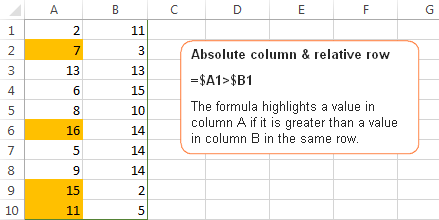 $A1 - you use an absolute column and relative row references because we want to check values in all cells of column A against the value in cell B1. 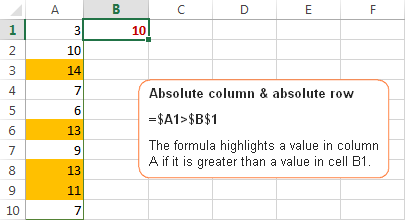 $B$1 - you use absolute column & absolute row because cell B1 contains the value you want to compare all other values against and you want this cell reference to be constant. This reference type is used in Excel conditional formatting rules least of all. You use relative column & relative row references when you want to check all cells of the selected range against a certain value. Tip. To quickly toggle between absolute and relative references, select the cell reference in the formula bar and press the F4 function key. The reference will rotate between the four types from relative to absolute, like this: A1 > $A$1 > A$1 > $A1, and then back to the relative reference A1. Excel formulas for conditional formatting based on another cell - the tutorial provides a handful of examples that demonstrate how to format individual cells or entire rows based on another cell's value in Excel 2016, 2013, 2010 and 2007. How to conditionally format dates in Excel - the article explains how you can apply Excel conditional formatting to dates using built-in rules and formulas. How to change the row color based on a cell's value - this article will teach you how to highlight entire rows based on a numeric or text value of a single cell. Alternate row colors and column shading in Excel - the tutorial explains how to alternate every other row or column in Excel. You will also find the formula to alternate row colors based on a value change. Change background color based on cell value - two quick ways to change the background color of cells based on their values. How to automatically highlight duplicates in Excel - see how you can use Excel conditional formatting to highlight duplicates values. Conditional formatting in Excel PivotTables - this tutorial covers some of the differences in PivotTable formatting in Excel. 64 Responses to "Relative and absolute cell references in Excel conditional formatting rules"
Where A2:A100 is the Pipe column and B2:B100 – the Bend column. I managed to do my conditional formatting on 4 columns next to each other in the same row but it only works with absolute row and column or with relative row and absolute column. If I have a relative column and absolute row it colors only 2 (first and last) of the 4 columns and if I change both to relative then it only colors the first column. Of course it would be handy to have both relative so that I can easily copy the cells. Also the copying works perfectly vertically (since the row is relative) but I want to make it work horizontally too. Hi Svetlana, quick question for you if you have a moment. I have a worksheet with conditional formatting down an entire column, delineated simply as $K:$K. However, as part of my team's process, we are constantly inserting new rows into the top of the range, and it's causing my Conditional Formatting rules to duplicate, with one set continuing the $K:$K applies, but the duplicates to apply only to the inserted range. Is there a way I can prevent that, either at setup or with a process change to how we insert our rows? How to create a condition like this: I want to count the number of cells of a range (let's say B1:B20) whose values are 10% of another cell, let's say B32. 1What is the code used to reference the cell in the eleventh column and fortieth row? I only want 43 to be highlighted, and it can be in either column, I just don't want the duplicate ones within the same column highlighted. Is that possible? My question is how to do a conditional formatting where I have to select multiple cells in a row and if those conditions are not met then the cells below either row or column need to be changed in color code. I understand excel does not allow multiple absolute referencing. Is there any formula through conditional formatting for this. Ex: The cells I selected are say E5 to I5 ( E5, F5, G5, H5, I5). These cells have the letter H to L.
I want the formula for this or an alternate method only through conditional formatting. The excel I am working is quite monstrous. Red (it should come 1st in the list of rules with the "Stop if true" option checked): =E$7=""
You write the formula for the left-most cell but apply the rules to all cells you want to highlight (e.g. E5:I5). Have loads of questions though will pose them as I come across. thank you so-much you are great. Please answer this question (I have to learn VBA, but for now walk me through baby steps without coding). I have a list in Column A with about 2500 different names. 1k are highlighted green, 500 red, 500 orange, the remaining blank. I recieve a different list with some names that match my original column A list. I want to see if the name in the cell in column b, matches with column A, and if it is highlighted(I highlighted manually as I progressed, not using any conditional) I want the new column, column C to show that name but now highlighted. Currently I use a VLOOKUP(B2,$A:$A,1,FALSE) and that returns the name of column B if it is in A however no color value is shown. I need to know which are not highlighted so I know which ones do not match or need to be "colored in"
I need your expert help and also of other members as well. I wanna know how to arrange multiple columns with huge data in such a way that first column's value would set in front of the next column if the values can find equal match in front of each other in a row otherwise the value would remain blank if it doesn't find its required same data . suppose i have numeric data and also other,if A:100 has a value 42001234 and column B has 42001234 in B386 then it could be arranged via sorting or other method but can we place or arrange them via technique or formula ? Just so you know... the scrolling icons at the bottom of the page looks really swish but I find it so distracting that I can't read the page. How do I use conditional format to set the color to the cells in each column Mon to Fri with the condition as follows? Because there is duplicate Names in Column "Name" and I want to use SUMIF formula for each cell in col "mon" to "Fri"
sum range is each column "Mon" and then "Tue" ..."Fri"
How do I do the formula with SUMIF in conditional format to set the color of each cells in Col "Mon" thru "Fri"? hi, I would like to conditional format a column so that cells will red if they contain values greater than the cell directly above them. I am not sure if you have seen this issue yet. I have an Excel 2010 worksheet that sets the color of each cell based on the text value contained in another. Why is Excel changing my conditional formatting formulas? I have tables in a worksheet with multiple conditional formats (Yellow fill, bold type, strike through font and double underline). These conditional formats use both relative and fixed position references in the four formulas. Some cells will display no formating, others display 1, 2, 3 or even all four formats, based on the formulas. This part I have working correctly. What I want to do is count the total number of cells that have the each of the four formats separately. So a cell that is both yellow filled and bold will be counted for each conditional formatting rule. It would return a number in a separate cell for each conditional format counted. I found several VBA formulas, but none work so far. I´ve read lots of info about this in different websites and yours was the only one that helped me solve my problem ! I get so frustrated with using conditional formatting to highlight cells. The way I work with spreadsheet data often involves cutting and pasting data from one cell to another and the conditional formatting quickly becomes garbled. If I have the formatting set to an entire column (ex: A:A), why on earth would it assume that if I cut and paste something from one cell to another within the column that I'd want the origin (now empty) cell to be unformatted (ex: cutting and pasting the contents of A6 to A7 leaves the conditional formatting with a new range of A1:A5,A7:1048576). Is there any way around this that I'm not realizing? The only working way that I am aware of is to convert a range into an Excel table (Ctrl+T), and then use the columns' names rather than their addresses in the conditional formatting rules. I have conditional formatting relying on a date where the cell is merged because I had to add another row in order to have the sub contractors listed separately. For example, I have rows 2 and 3 for a task and columns A, B, C, D, E, F, G, H, I, J, K, L, M, N, O and P are all merged however once you get to column Q, R, S, T, U they are no longer merged to show the distinction between the 2 different sub contractors on the task. Column V is merged again. My problem is Column I which is the expiration date of the task is the condition to turn all the cells to the color requested. Because column I is merged the first subcontractor in Row 2, Column Q, R, S, T, U will turn the color but the second sub contractor in Row 3, Column Q, R, S, T and U will not turn the color requested. It will only happen if I don't merge the Column I which has the expiration date and I put the date in both cells (2 and 3). PLEASE HELP IVE BEEN WORKING ON THIS FOR 3 DAYS!!!!!! How can set a conditional format such that the first occurrence appears as bold and the rest as normal. In the above list, the first occurrence of 5, 8, 4, 6, and 7 should appear as bold, while the rest can appear as normal. For the detailed steps to create the rule, please see the following tutorial: Excel formulas for conditional formatting. The point is that Excel formulas deal with cell values, not cell formatting. To fix the issue, you can select the cell with your formula, and click the 'Wrap Text' button on the Home tab, in the Alignment group. Thank you Svetlana, its working. The original value is in column C, the comparison value is in column F.
this seems to apply the conditioning randomly, whether the cells match or not. I am producing an excel table that has details of people with expiry dates of their qualifications in four columns. I have managed to conditionally format the cells containing the dates to change colour with less then 6 months to run to expiry and when expired ["cell less than"=NOW()]. I have the surnames of the people in column A. What I would like to do is change the colour of the cell containing their surname if they are expired (depends on data in 4 different columns) and also for the colour change to move correctly with the rows should I sort one of the columns other than surname. please, I need to find out right rule of a conditional formating for more than one cell value in a whole table columns. =AND(50, 30, 20, ... )? - for more values e.g. =$K$20=Prih_knjiga!$F$740. Can you help, and can you tell me where I was have mistake? I can send you worksheet so you can try if you want. On the other test workbook i was try with CF and everything work perfectly. I don't have time to closely peruse the whole article but you don't seem to have mentioned that by clicking in the cell reference in the formula bar and pressing the F4 function button the formula will rotate between the 4 options from completely relative to completely absolute. I want a cell to turn yellow if the date is approaching. When I try to duplicate my conditional format the cell referenced in my formula will not go to the next row. I will try to use the same conditional formatting for cell D7 but because the formula says D6 it will not intuitively add a row. It continues to reference D6. How can I make my conditional formatting useful on all rows and not have to make 1,000 rules for each row? I'd like to copy and past (or Insert) a line with conditional formattings on certain columns. E.g. "duplicate values", to be sure that new data edited on this new line has unique data in. BUT: paste does only work, if each cell is copied and paste individually. If you paste (or insert) a full line, the ranges in the conditional formats will be splitted. E.g. a range $N:$M will be $N$1:$N$215;$M217:$N65532 on the old (conditional formatted) cells and the new cell has $M$216:$N$216 in. Is there a solution, where the conditional format range is still $N:$M? I have the impression, that with old Excel versions, this was working. Perhaps there is an option for copy and paste? I get all the conditional, absolute and mixed formatting formulae using $. However, whatever I do, excel always puts it all back to absolute! I am having a problem with comparing two cells using conditional format and if there is a variance of >0.5 the cells turn orange. I have the formula =a1 * b1 in cell c1 where a1 = 2 and b1 = 10, and the resulting value is 24? why is it not 20? It could be that the cell a1 has the actual decimal value 2.4, cell formatted to display rounded values which in this case is 2. So the formula applies to the actual decimal value a1=2.4 and not the round value displayed. I have a spreadsheet with two columns D and I. Column I has values ($1 to $26) filled in from rows 5 to 30 i.e (I5 - I30). Now in column D the values ($1 to $26) will be filled in on a bi-weekly basis (every 2 weeks).Its for a challenge were all the values from $1 to $26 are cut out in small pieces of paper and placed in a lucky dip container with one picked on a bi-weekly basis until the container empties. I want to create a conditional format to strikethrough the values in column I every time column D is populated with values duplicated to that in column I after each dip. how to write a format for:"if the name in column 2 same with name in column 4, they will become blue colour background"?? THANK YOU THANK YOU THANK YOU - conditional formatting for a column has just taken me far too long to resolve!! We all know that using a cell reference we can get data from a cell being referred. Is it possible to get the formatting as well, using a cell refernce. unfortunately, no cell reference will copy the formatting. Feel free to read our great tutorial about other easy ways to copy formatting in Excel. Excel 2016. My relative formatting won't stick in the conditional formatting rules manager box. When I edit any of it to relative, then hit either Apply or Close, it goes right back to full absolute, adding the $ back in wherever I deleted them. Then, when I copy down or paste formatting, it doesn't work right. I have 4 numbers across, and want red font on the smallest number. So in each case, the lowest of the numbers should be red. I can do them individually, but I need to be able to copy the conditional formatting to all rows. In my worksheet,i have different conditional formatting in the rows, of the same column. But when i sort, it all mixing up. i hope u understand. Please help me to resolve this. i want a formula to compare two cell in different column. column A is variable and column B is constant,when value in column A is +/- 1 of a value in column B then cell A should change its color. I want relative references for each cell in a block. I set for 1 cell & copied to the rest. However, it's treating the relative reference as tho it applies to the whole range, rather than each cell individually, so the value used is only the cell relative to the first cell. How do I get excel to treat each cell individually? I want to have one cell change to yes or no based on 2 sources. I am trying to use conditional formatting to change the color of the text in a cell if the date is less than the date in one cell or greater than the date in another cell. I would like Cell G3 to turn red when 23Oct18 (for example) is entered. =$G$3>$F$4 and =$G$3$F3) but then the date in G3 does not change color anymore. Do I have to retype the formula for each cell each time? I will have at least 40 columns of dates to sort this way and multiple rows that I would like the formatting to apply to for each cell.